The Devolver Digital parking lot has been the best part of E3 for half a decade, even though it's technically not associated with E3 at all. A big white balloon marks the spot across the street from the Los Angeles Convention Center where a handful of bullet-like Airstream trailers huddle around tents offering free beer and hot sausages wrapped in tortillas. A giant screen sits under the shade, pixels flashing as a group of people play the latest local multiplayer game under Devolver's publishing label. Some years, an arcade controller with neon dildos as joysticks sits on a low table in front of the screen, waiting for someone to load up Genital Jousting. High-profile indie developers float in and out of the parking lot, showing off their games in the trailers and indulging in the festivities. This scene is about to change. 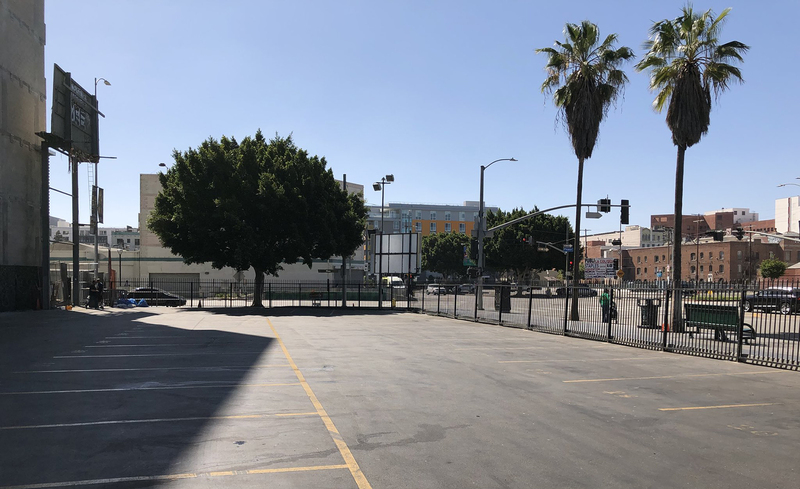 E3 2018 may have been the final installment of the Devolver parking lot -- the building next door, which used to house a Hooters and the Fuego Lounge, has been sold and it's scheduled for demolition just two weeks after the convention. The landscape around E3 is changing, and it might take Devolver with it. "Indie publishers, we're smart folks, despite how we look, and we can come up with some clever ways to be a part of E3 without paying exorbitant prices to be inside a convention center," Devolver co-founder Nigel Lowrie says. "We can come up with some clever ways to be a part of E3." In Serious Sam 4: Planet Badass, the action comes hot and heavy. Croteam only guided me through a few minutes of Serious Sam 4 gameplay, but it was more than enough to make an impression. Those familiar with the series will recognize enemies, only for this installment they've been updated with new looks. And they look equally terrifying and ridiculous. My personal favorite is the headless screaming kamikaze who's holding a bomb in each hand (pictured above). Sam traverses the countryside pretty much shooting anything that moves, meeting others and adding weapons to his arsenal along the way. There's a much larger scale overall, but this game doesn't have the desert levels previous titles showcased. In the final part of the demo I saw, Croteam joked that they were going after the Farming Simulator crowd. Sam comes across a combine harvester and starts mowing down enemies in a wide open field. As you might expect, he's doing so while also firing machine guns out of the front and sides. The clip ended with the comedic badass driving up on a wave of 100,000 enemies, offering both a taste of the action to come and ideas on how he might survive. Based on my early look, there should be plenty of shooty shooty bang bang fun to be had with Serious Sam 4, and you'll be able to do so when it arrives later this year on consoles and PC. The ESA doesn't make any money on the parking lot, a fact that Devolver founders have pointed to as motive for the organization's ire. One year, the ESA parked a row of semi-trucks between the Devolver parking lot and the LACC, blocking the trailers from view. The next year, Devolver showed up in the same spot with that giant white balloon, its name emblazoned in red high above the Airstreams. 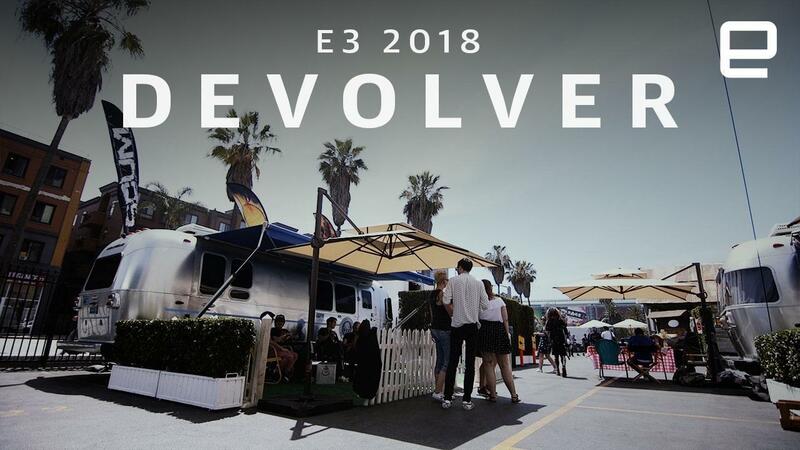 Devolver isn't the only publisher to move its business outside of E3 proper: Electronic Arts ditched the show floor in 2016 and established the EA Play event, and Activision decided against paying for a booth the same year. Devolver has hosted anti-E3 press conferences poking fun at industry standards (while also showcasing its latest games, of course) for the past two years. This year, Devolver revealed it was working with From Software on a re-release of Metal Wolf Chaos -- one of the biggest titles the publisher has ever snagged. At the same time, its shows have served as a lightning rod for online conversations about the ridiculousness of major media briefings and calls for a more relaxed, fan-focused event. Devolver knows how to play the E3 game, even if it doesn't actually attend E3. For the developers inside of the Airstream trailers, the Devolver parking lot is more than a mini festival with free booze. It's a chance to get their games in front of hundreds of people, gather feedback and generate media buzz. It's an opportunity to be discussed in the same breath as billion-dollar franchises; it's a chance to be taken seriously as artists and creators. It's as good as actually attending E3. "It's given me so much energy." "I've been sitting at home working on this game for over three years now, and you're never really sure how people are gonna feel about it," My Friend Pedro creator Victor Agren says. "But coming here, being able to show it to tons and tons of people over multiple days and getting amazing feedback ... it's given me so much energy to go back and finish this stuff and make it as good as it needs to be." Super Meat Boy. N++. Superhot. The number of classics that got their start as free online games is impressive, and My Friend Pedro looks destined to join that list. Originally an Adult Swim flash game, a full version of My Friend Pedro has been in the works for over three years, and is set to be published by Devolver Digital. The best way to describe it is as a side-scrolling Max Payne, but really that's not doing it justice. It does share its core with that series. You face off against a seemingly insurmountable number of enemies, but can even the odds by slowing down time. Where it differs is in flexibility. Rather than just jumping and shooting your way through levels, you can approach enemies more creatively. As I only had 30 minutes with the game, I'll give an example from the trailer: You approach a trio of enemies from below, and shoot a skillet into the air. You then slow down time, and shoot the skillet with an SMG, ricocheting the bullets off its base and into a your foes. While I never quiet reached those dizzying heights, My Friend Pedro was incredibly fun. It seems that, as the game progresses, the difficulty will increase to the point that it might be better describe as a puzzle game. One where the only way to progress is to work out the optimal path to dispatch a stupidly large group of enemies. In that way, perhaps it shares more with Superhot than just its beginnings as a web game. My Friend Pedro is due for release in early 2019 on PC and Nintendo Switch. It's unclear where Devolver will be at next year's E3. It depends on whether the team can find another location for the parking lot, and whether they think it'll be worthwhile. One thing Devolver excels at is adapting, flying by the seat of its pants, going with the flow. Or, more often than not, creating a brand new flow. Just next door to the Devolver parking lot at E3 2018, Good Shepherd Entertainment hosted a new showcase called Indie Heaven, filled with art installments, interactive VR experiences and plenty of independent games. Good Shepherd is a new publishing house from Devolver co-founder Mike Wilson and it approaches the industry with a similar spontaneity and disregard for tradition. Though the parking lot might disappear, Devolver is hardly the end of indie games at -- or just outside of -- E3.